“We interpret this finding as evidence that Medicare eligibility persuades people to retire, because they can begin receiving federal health coverage,” Coe and Rutledge write. People select their retirement dates for a host of reasons: fed up with work, physically unable to work any longer, yearning to travel, or finally able to afford retirement after paying off the house. The most common retirement age, hands down, is 62. But age 65 is also popular. Financially, the decision to retire by age 65 may not always make sense for a U.S. population that is living longer, hasn’t saved much, and could use the bigger monthly check that comes with delaying Social Security benefits a little longer. An early retirement date is a decision that can reduce a retiree’s financial well-being for decades. A key reason Medicare coverage often serves as a retirement trigger is that, right now, obtaining coverage elsewhere is difficult given that employer health coverage for retirees has been declining. Such coverage plummeted to only one in four large companies last year, down from two out of three in 1988, according to the Kaiser Family Foundation, a health research institute. Health benefits are even rarer at small companies. 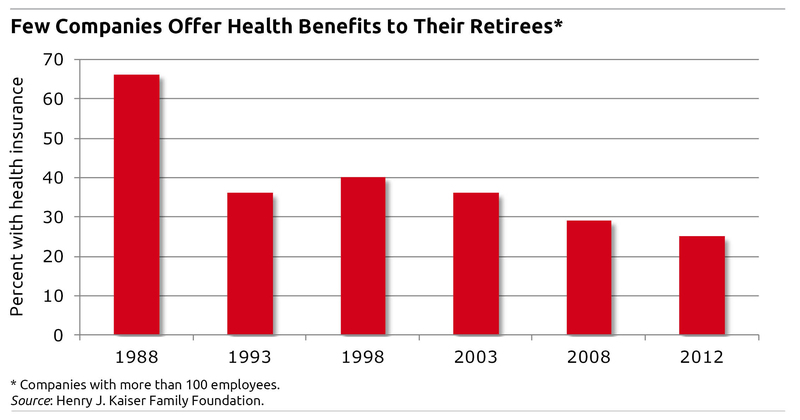 But Medicare may not maintain its influence on the retirement decision forever. If the Affordable Care Act, after its full implementation in 2014, provides more access to reasonably priced health coverage outside of the employer-employee relationship, then we may not see so many people holding out for Medicare. At that point, your 65th birthday may be just another date. How does health care coverage influence your work and personal finances? Readers can email their thoughts in the comment field provided below. You do not have to retire and claim Social Security benefits at age 65 to be on Medicare. Currently, self-employed people are kicked off their private insurance at age 65 and have to go on Medicare. It would be surprising if this would change with ACA. Please, let’s not scare people unnecessarily. Much depends upon the plan, specifically, whether it is an employer sponsored group plan, or an individual market plan. First, if actively employed and enrolled on an employer’s group medical plan, you are NOT automatically kicked off your private insurance plan at age 65! Any employer who even implies this or suggest the employee leave the plan courts serious DOL trouble. Those still working with employer group coverage may remain on that plan, plain and simple. This arrangement is usually called a Medicare Wrap, as it wraps around the employees Medicare A and/or Medicare B. That said, there may be reasons to voluntarily leave an employer-sponsored plan in lieu of Medicare A and B, plus supplemental coverage to Medicare. The prime reason is cost. Premiums for Medicare Supplemental coverage can run from $100 to $200 per month, depending on the plan selected and where you live. This may be drastically less than what it would cost to remain on the group plan. Those covered as dependents under a spouse plan are also likely to need to work through the same decision process. Another reason to consider coming off the group plan is that Medicare Wrap coverage may still subject the employee to significant deductibles and not as efficient a coverage as a true Medigap insurance plan. For those with individual market plans (i.e. not employer-sponsored plans), there are those where the coverage ends upon Medicare eligibility. Even so, the beneficiary turning 65 allowed to keep their plan, may still be better off with Medicare A and B plus a Medigap insurance plan. The prime drivers again being monthly premium costs and which plan best integrates with Medicare. The bottom line: Turning 65 doesn’t automatically cause you to forfeit your current coverage. You will have choices and it is important to explore all of them carefully. A good insurance agent who specializes in this area can be of great help. Employer HR departments should likewise be knowledgeable or consult your local Dept. of Aging. I think many people today use age 65 as a retirement trigger because they focus on the availability of health care under Medicare. Assuming employer coverage is generally unavailable, health reform is intended to provide affordable options (I think that’s debatable, but assume affordable options exist.) That will likely drive folks to retire before age 65. But I think this creates a huge negative. For every year of earlier retirement, it means another year more without wage income, which requires more savings. It will simply mean, on average, less years working and more years in retirement. That requires even more retirement savings for the undersaved that already exist today. If health care reform provides pre-65 retirees with better, affordable access today, it will simply create a bigger pool of people outliving their retirement savings. That’s bad news, and a bad unintended result of health care reform. Why would a self-employed worker, who I assume is funding his medical insurance fully, not RUN to Medicare at age 65? All the health care he pays for would be the Medicare charge: $100 plus the cost of a supplemental policy. That would be approximately $250 per month versus $700 or 800 (assuming he’s single, obviously spouse and/or family changes the dynamics). The Affordable Care Act benefits all those with insurance in terms of preventive benefits that are now required and also extends to those with Medicare. Otherwise, the ACA largely exempts Medicare beneficiaries from any noticeable changes to their coverage. Medicare was largely addressed previously by the Medicare Modernization Act. Still, during the last presidential campaign, both sides demagoged one another with Medicare. There was the $800 Billion “cut” to Medicare Advantage plans, but nobody bothered to add back the new preventive benefits extended to all with Medicare. Then one side piled on the other for advocating “vouchers” when in effect such an arrangement already exists, called Medicare Advantage. Lets not forget one of the biggest benefits of the ACA, health care for all regardless of age and previous medical conditions. Consider a person in their fifties who becomes unemployed and cannot find another job. If this person has allergies, they are often rejected by private insurance companies because of ‘previous medical conditions.’ OK, well we all know the real reason is that private insurance companies look at this age group as a much higher risk. This factor alone in previous years has forced individuals to work longer because you cannot take a risk and go without insurance once you hit this age group. The “preventive benefits” you tout are not a form of insurance; insurance per se but a REIMBURSEMENT for a loss. Prevention is beneficial but let us not confuse health with medicine. Health is simple and free: eat right, sleep right, exercise right, avoid risk behavior, these are individual choices which have a financial impact. But by institutionalizing this and mandating it in the insurance contract, you transfer responsibility health away from the person on into “the system,” where nobody is responsible. Now I am forced to lose my own premium to subsidize the irresponsible and stupid behavior of others. Since I have less money to promote my own health, I am less at liberty to compete in the world. And I am forced to rely on the corrupt medical system for my ‘care.’ It is anything but care. It is a machine, and like every other system, it’s only agenda is to extract money and make me dependent. You can argue issues and fact and references but it is all bu——. The single most important ingredient in health is the WILL to health, which you weaken by transferring responsibility to the ‘plan,’ the system, or anything other than THE PERSON. If this does not signify a cost shifting, what does? Did you ignore this willfully? Either way.